Leaves are alternate, simple, lobed; with rounded tips. Fruit is an acorn. The white oak is one of our most important, largest, longest-lived and most valuable timber trees. It grows to 100 feet in to 4 feet in diameter. In the timber it forms a tall, straight tree, but in the open it is wide and spreading. Found over all of the eastern United States, it occurs on a wide variety of soils, but usually on upland clay soils. The single leaves are 4 to 7 inches long and about half as broad, deeply divided into seven to nine rounded, fingerlike lobes. The young leaves are a soft, silvery gray or yellow to red when unfolding, later becoming bright green above and much paler be low. The acorn is about 1 inch long, elliptical, and covered about 1/3 its length by a finely scaled, rounded cup. The twigs are fine, and gray to green in color. The bark is ashy gray to a very light gray and decidedly scaly. On older trunks it is somewhat ridged, but remains ashy gray and scaly. Height: 80 to 100 ft.
Trunk Diameter: 3 to 4 ft.
Longevity: 500 to 600 yrs. Tolerance: intermediate, tendency to become more intolerant with age. 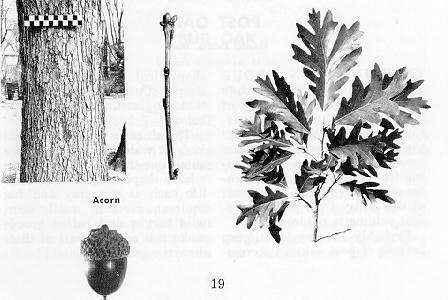 Acorns are food for wildlife. Has large pores, but plugged up by resin; wood could be used for root beer barrels.